I was very glad when i discovered that A v i had made "a package" for sublime that gave it the best features from SciTe4AutoHotkey. But i have to say that i prefer the interface in TillaGoto in prior to GoTo. So I tried to combine them. And of course, all i've done is ctrl+c, ctrl+v for some hours, all credit goes to A v i, TheGood and Rajat..
Beautiful ! Thanks for sharing . Also, would you specify somewhere in the top that the main shortcut is ^Space ? It was difficult finding that. Thank you, A v i, for doing the hard work. I updated the info, and gave credit to Rajat who started it all with Active GoTo, way back in the day. Yes, if you use a Scintilla based editor, like SciTE or Notepad++, TillaGoto is better then GotoTilla. 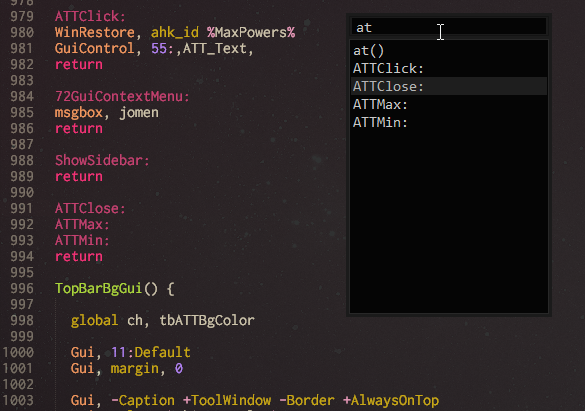 But if you're like me and Avi and prefer to use Sublime Text this is as for now the only alternative.